Heat oven to 350° F. Place cereal in resealable food-storage plastic bag; seal bag and crush with rolling pin or meat mallet (or crush in food processor). In medium bowl, mix cereal and tomato puree; let stand 5 minutes. Cut bell peppers lengthwise in half. Remove seeds and membranes. Place peppers, cut sides up, in ungreased 13 x 9-inch (3-quart) glass baking dish. In 10-inch skillet, cook beef and onion over medium heat, stirring occasionally, until beef is thoroughly cooked; drain. Stir in cereal mixture and remaining ingredients except cheese. Divide beef mixture evenly among peppers. Cover; bake 40 to 45 minutes or until peppers are tender. Sprinkle each pepper half with 1 1/2 teaspoons cheese; let stand 5 minutes. Bell peppers, regardless of their color, provide vitamin C also called ascorbic acid. Choosing vitamin C-rish foods keeps gums and blood vessels healthy. 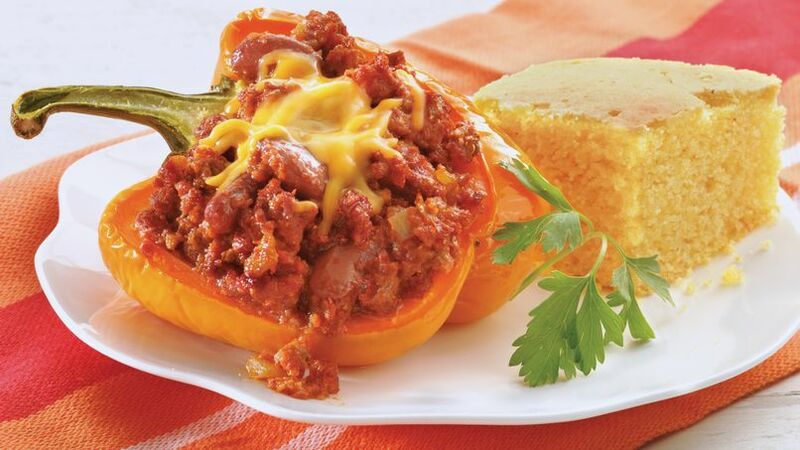 Breakfast cereal is a unique ingredient that helps keep these hearty, colorful stuffed peppers low in fat and high in flavor!